Excerpt from 1871 Map showing North Street, Wolverhampton. After the minimal protest “The Old Fox” has gone and North Street is once more bereft. While I grieve for the loss of the “Fox” ( Late Wanderer) I grieve for myself too. For what I have lost for and for what is past and can never be brought back. Another piece of my childhood Jigsaw has been lost forever. No longer will I look at this age old building and be transported back to our old terraced house close by in Nursery Street, and the golden days of my youth. Back to the days just after the war, Storing bikes for the fans at Molineux on match days, off to the Saturday afternoon matinee’s at the Olympia, in Thornley Street, swimming in the canal of Littles Lane and watching those steam belching monsters pulling out of the High Level station to all stations north, from our vantage point above Broad Street Basin. After it became known that the Wolves Club wanted to extend their car-parking facilities and demolish the Wanderer, there was an online petition to save it, which as we know now came to nothing. As part of this protest I sent a last desperate plea to the Express & Star on the 24th of October 2014. This is that letter now illustrated. I reckon there must be hundreds of Old Wulfrunians born in the shadow of St Peter’s deeply saddened once again today as they contemplate another historic piece of their childhood disappear in the name of Progress i.e. “The Fox” ( late Wanderer ). 1901 – Picture it at the turn of the 20th century. The old Fox was close to “Tin Shop Yard” and the trade that was doing very well around North Street in those lean times, were pawnbroker’s and second hand shops. “Caswells’ gents outfitters and boot dealers, pictured on the left were perhaps one of the better class establishments, doing business at that time. Beside the tin trade in the area this was also the home of horse trading, and a would be purchaser, could alway’s raise a few pounds at Caswells, in exchange for a gold watch or similar item. 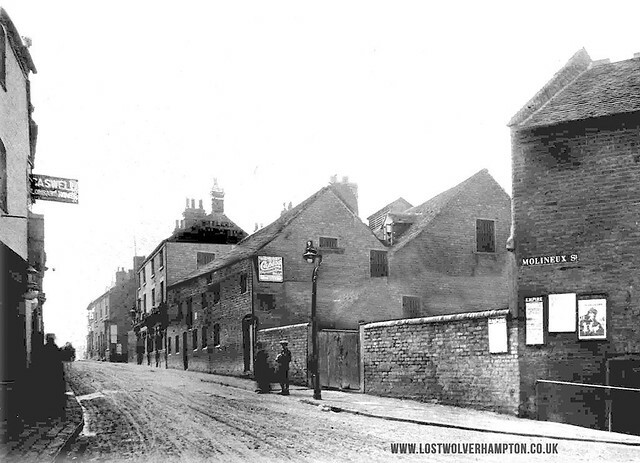 The large building opposite ‘Caswells’ was a Malthouse, and to the left of this was the old “Fox Inn’, a William Butlers house the licensee at this time was William Blud. 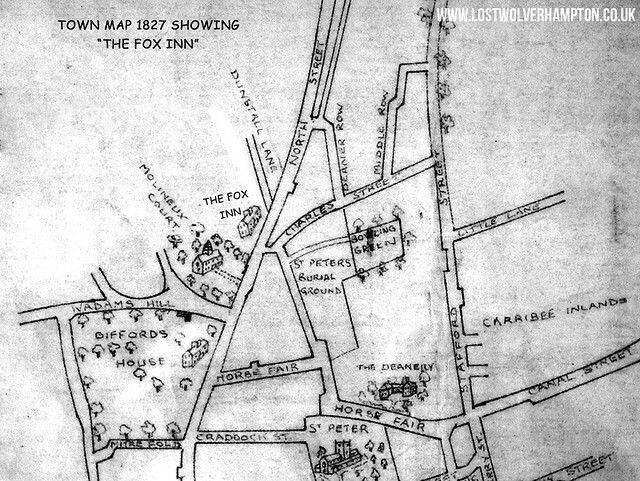 Later in 1913, the new “Fox Hotel” will be built a little nearer the top of Molineux Street. Opposite the old “Fox.” was the entrance to “Tin Shop Yard’ , St Peter’s Square and Charles Street. 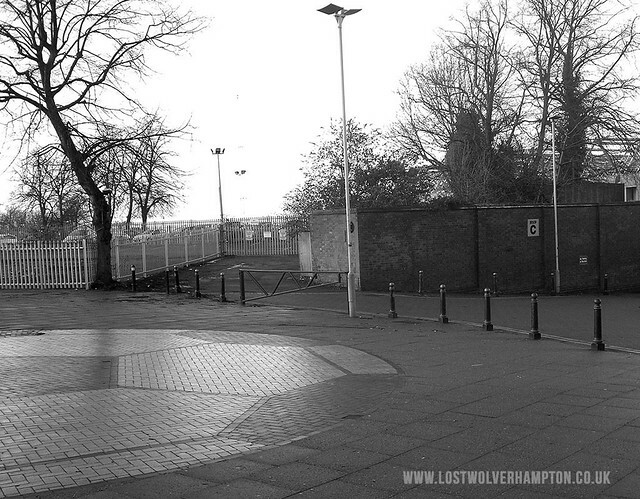 There was a lot more though to the old Fox than what it later became – a local for Wolves Supporters. Town Map showing the Fox Inn circa 1827. For over over two hundred years has played its part in the diverse history of our Town now City. In the first instant it is mentioned in the local press in 1817, just two years after the momentous battle of Waterloo had brought the Napoleonic wars to an end. The event mentioned took place here; in Wolverhampton and was later to become known nationally as the Blood Money incident. It came about when two soldiers sentenced at Stafford to hang for Highway robbery, and later reprieved, were billeted at “The Fox”. The two Soldiers of a detachment of the Ninety Fifth Foot billeted at the The Fox in North Street were charged with assaulting and robbing a man called John Read, in St Peter’s Churchyard. It became known country wide as the Blood Money incident of 1817. There subsequent trial and its outcome, brought about the abolition of Blood Money and the closure of the local prison in Stafford Street. 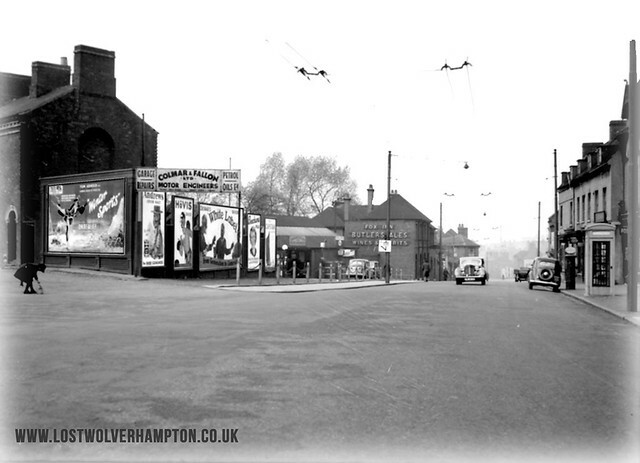 1940s – Looking down North Street from Molineux Fold the Fox can be seen on the bottom left. To see this iconic building go will also be a personal loss for me,as my father met and courted my future mother there in the early 1930’s, it was his local and my mother was in service there to the tenants, Mr and Mrs Rogers. who later went to “The Ball “at Coven. They married at St Peter’s & Pauls Chapel, and held their wedding reception, at the Fox in 1936 and moved to the family home in Nursery Street close by, were I was born in 1937. 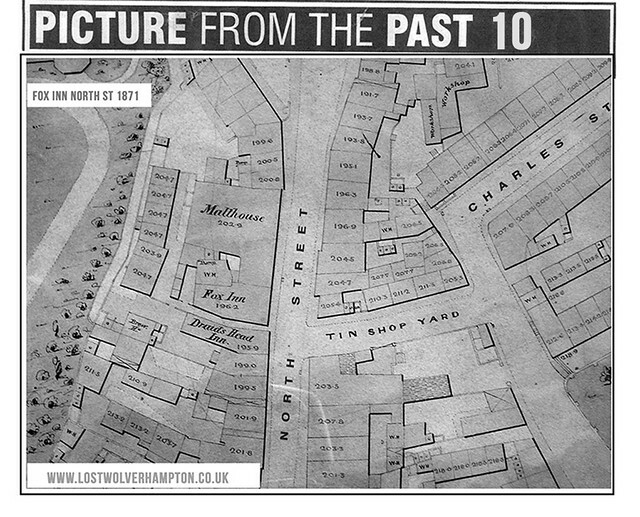 The former yard and stables behind the wall on the right at the top of Molineux Street. After they married, the Fox still remained his local, and it was two years later in 1939 I had my first introduction to this House albeit only to the stables. This story was repeated by my father over the years, on numerous occasions. In 1939 , The celebrated Film Star cowboy Tom Mix appeared for a week at our local theatre ,the “Hippodrome“, and as it was then with quite a few of the animal acts appearing at the Hippodrome, he stabled his horse Tony at the bottom Fox as it was then known. The locals in North Street enjoyed chatting to Tom and he loved the attention, it was during this week that my father brought me as a two year old, to the stables and I got to sit on Tonys back. 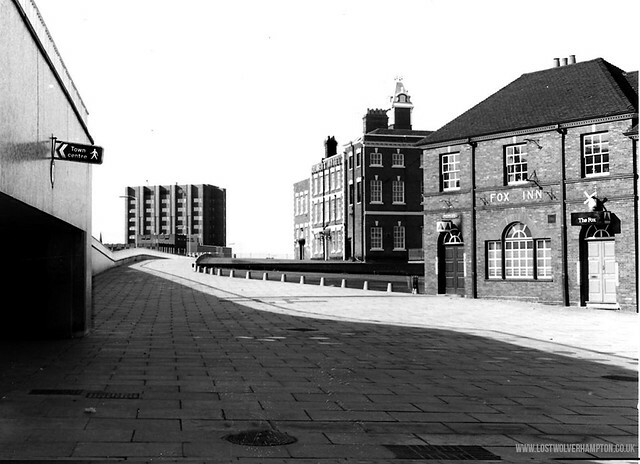 Both the Molineux and the Fox still serving Butlers Ales, all alone now fronting the Underpass in 1974. My Father died in 1975 as the bulldozers were working frantically across the area we knew as St Peters Ward. I often wonder what he would have thought if he came back and saw what was left of his North Street today. Please do what you can to rally support, as you have done on many previous occasions, to save The Fox and The Feathers, that were once integral parts of My Playground. The scene today in 2015. All to no avail – Its now gone “But it will never be Forgotten”. I wondered if anyone could give me any information on 2 Tin Shop Yard? My Great Grandparents Thomas & Fanny Hill (nee Haycock) are recorded as living there in the 1911 census. Their elder son, Albert Henry Hill, is my grandfather, came here to Jersey with the 4th South Staffs in about 1915 and then left for the Front. He survived the war and came back to Jersey but left in about 1920 and has been untraceable ever since. He married my gran in 1916 and they had 3 children between them. It’s a thrill to see the family quarters in this article and if any local historian can has any knowledge of either Albert’s whereabouts or the Tin Shop Yard I’d be very grateful. This photo taken in the early 1950’s, shows the small carriageway and the now derelect patch I recall as, shown on the 1871 map known as Tin Shop yard. This whole area will be transformed a little later by our present ring-road. It was said the name Tin Shop Yard came about when the Tin-Plate and Japanning trade moved from pontypool to Wolverhampton. In the snowy background on this winter scene is the former Molineux Hotel now in 2015, housing the Wolverhampton Archives. will give you all the facts and figures on this subject. A big thank you for all the hard work you put into this site, A real pleasure to have access to all this wonderful information from the past, Oh those were the days ! 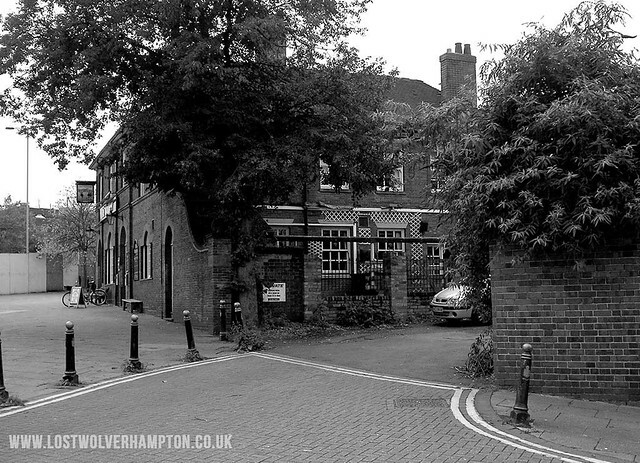 Thankyou Mike As you might have gathered I have a passion for Old Wolverhampton – North Street and its surrounds in particular -As that was my Playground. Best Wishes.